SEBI on Wednesday told the Supreme Court that Sahara group overvalued its properties and did not hand over all original title deeds of assets worth Rs 20,000 crore (Rs 200 billion) as per its direction. The market regulator said that apex court's order has not been complied with by the group and assets whose documents were given to it is worth much less than Rs 20,000 crore. A bench of justices K S Radhakrishnan and J S Khehar expressed displeasure on the issue but refrained from passing any order as the Sahara's arguing counsel was not present in the court. "It is a mockery of our order if it has been complied with in this way," the bench said and posted the case for hearing on Thursday after Sahara sought adjournment on the ground of non availability of its counsel. It told the group that no excuses would be entertained tomorrow when the matter would be taken up for hearing. 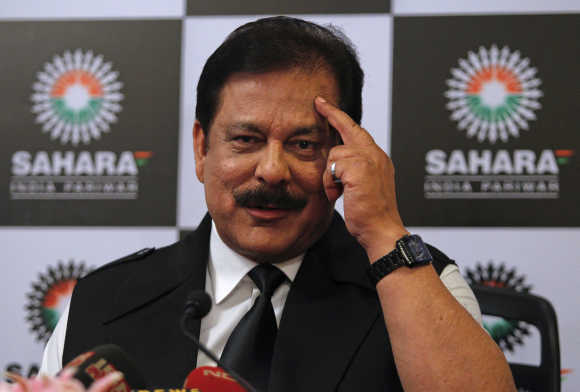 Sahara gave SEBI documents of two plots of land. One of the two properties is a 106-acre land in Versova, a western suburb, which according to it is worth around Rs 19,000 crore (Rs 190 billion) and the other is a 200-acre land in Vasai, which it estimates to be worth about Rs 1,000 crore (Rs 10 billion. The valuation of the properties was challenged by SEBI. SEBI contended that a portion of the properties were in the "thick" of litigation. Holding that it was playing "hide and seek" and cannot be trusted any more, the apex court had on October 28 directed the group to hand over title deeds of its properties worth Rs 20,000 crore to SEBI with a warning that failure to comply its order to the satisfaction of the market regulator within three weeks would mean Sahara chief Subrata Roy cannot leave India. Making it clear that there is no "escape" from depositing the investors' money with the market regulator, the apex court had also asked the group to also give valuation reports of the properties to SEBI which will verify worth of assets. The court was hearing three contempt petitions filed by SEBI against Roy, the two firms--Sahara India Real Estate Corp Ltd (SIREC) and Sahara India Housing Investment Corp Ltd (SHIC)--and their directors. It had on August 31 last year directed the Sahara group to refund Rs 24,000 crore (Rs 240 billion) by November end. The deadline was further extended and the companies were directed to deposit Rs 5,120 crore (Rs 51.20 billion) immediately and Rs 10,000 crore (Rs 100 billion) in first week of January and the remaining amount in first week of February. The group, which had handed over the draft of Rs 5,120 crore on December 5, has failed to pay the rest of the amount.